I usually hate the trendy London restaurant scene. All that queuing, and sitting amongst armies of bloggers taking pictures of everything with £1000 cameras. Not for me. 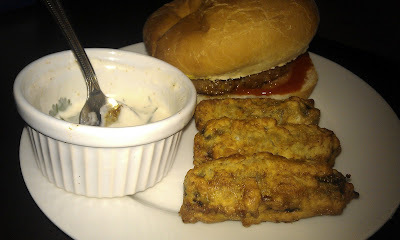 But I must admit that after visiting such a place, and trying deep fried pickles, I had to give it a go at home. I made a batter from milk, flour, and an egg - plus salt and cayenne pepper. 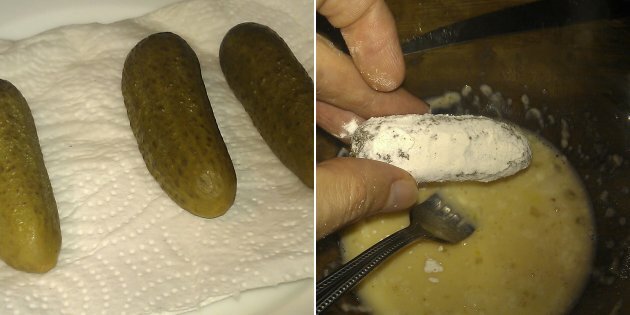 I dried out the pickles with kitchen paper, rolled them in flour, dipped them in the batter, rolled them in the flour again, and popped them into a pan of hot oil. They were done very quickly - just a minute or so. 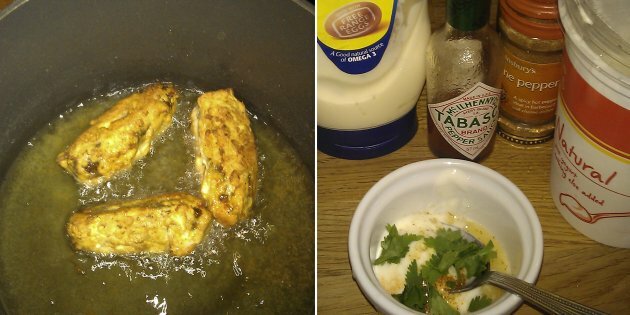 I dried off the excess oil, sprinkled with more salt and pepper, and made a quick dip from mayo, yogurt, coriander, lime and cayenne pepper. I ate them with a cheeseburger on the side. They weren't bad, but to be honest my batter recipe wasn't much cop. They need to be a bit cripsier. Maybe breadcrumbs would work better. Or maybe I should just read a recipe, rather than making stuff up on the spot. The dip was good though. I reckon a tempura batter could be pretty awesome with these.